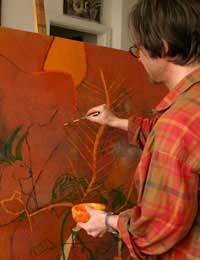 The Art World can be a daunting place for an artist starting out on their career. For many it will take years to even get a foothold in the galleries, for some it will never happen. The fact is that competition amongst artists is huge these days, with attendance to art colleges swelling each year. For this reason dedication and a pragmatic attitude are needed to succeed. Dedication is something only you can equip yourself with, though if you are having trouble, reading around the lives of famous artists may help. Pragmatism involves being realistic about the art world and about your aims. The art world is a money making industry like any other, and whilst art has the capacity to freely communicate things in a way that other elements in society (f.e. politics, journalism, the mass media) arguably cannot it always operates within the wider framework of the world market. To operate outside that basically means that you won’t make much money and, moreover, you won’t communicate your message to very many people. Things get a little more complicated (but not too complicated) when we consider that all areas of commerce already contain within them something akin to the artistic impulse. That is to say that selling a product involves casting some kind of desirability around that product, which in effect amounts to projecting an illusory value on that product. For example, whilst Prada clothes are undoubtedly of high quality, their very high price centres upon the illusion of sophistication they endow the wearer with. This is of course just one example of the kind of illusion marketing and advertising people project on to products: Other products may claim to endow the owner with intelligence, sexual prowess, fashion credentials and so on. This ability to create illusions is something that art always does. It is what art is. Art is the habit of making something appear to be something it is not. For this reason art is in the curious position of at first being an illusion in itself, and then of having to project an illusion as regards its desirability in order to stand out in a saturated art market and grab the attention of potential buyers. Hence the artists job is never over and involves a whole host of tasks beyond merely making art. The artist must be a self promoter, their own personal assistant and marketing guru, a great communicator in both the written and spoken word and a great networker. If they lack any of these tasks, or haven’t got time for them, they may need to recruit the help of friends or (if they have the money) employ others to help. Many artists deliberately choose what they wear and how they are seen in order to attract (or deflect) attention –thus adding to the artists allure. To understand this is essential, whether you like it or not, to developing as an artist. The main thing is to find a way of dealing with the art market that you feel comfortable with – you do not need to be bold or brash, but you do need to be realistic. Art may be an illusion, but it is as firmly stuck within the world of commerce as anything else. In fact, employing the mechanism of illusion makes it closer to the word of sales and marketing than many artists would like to admit! You're speaking about big name artists. For most of us, the art world is a much smaller world, and we're not represented by major galleries, with work in collections and museums around the world. For every Damien Hirst or Tracey Emin there are truly hundreds of artists trying to scrap[e a living. We work just as hard (probably harder, as we don't have a team of assistants) and in some cases just as much talent, but not the breaks to make a living from our work. So all we can do is look on with a little amount of envy and hope for the future.